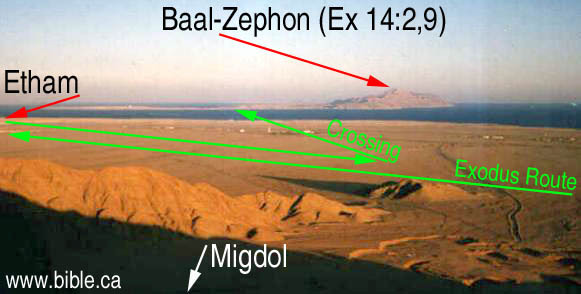 Baal-zephon is located at Mt. Tiran, which is 501 meters high. Mt. Tiran is located on Tiran Island, Saudi Arabia. 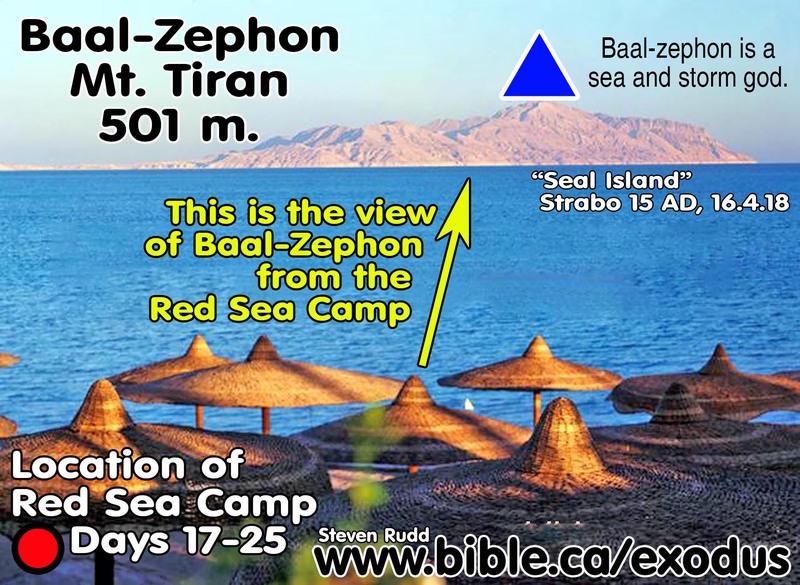 It is clear that Baal-zephon was a clearly visible marker across the Red Sea. Pi-hahiroth means a "mouth of water" in Hebrew. Notice that "Pi-hahiroth faces Baal-zephon" in Num 33:7. If you look at the "mouth" it indeed faces Baal-zephon! Exodus 14:2 :"Tell the sons of Israel to turn back and camp before Pi-hahiroth, between Migdol and the sea; you shall camp in front of Baal-zephon, opposite it, by the sea. Numbers 33:7: They journeyed from Etham and turned back to Pi-hahiroth, which faces Baal-zephon, and they camped before Migdol. The second geographic marker about Baal-Zephon is that "Pi-Hahiroth faces Baal-Zephon". Pi-Hahiroth was the mouth of water which faces Mt. 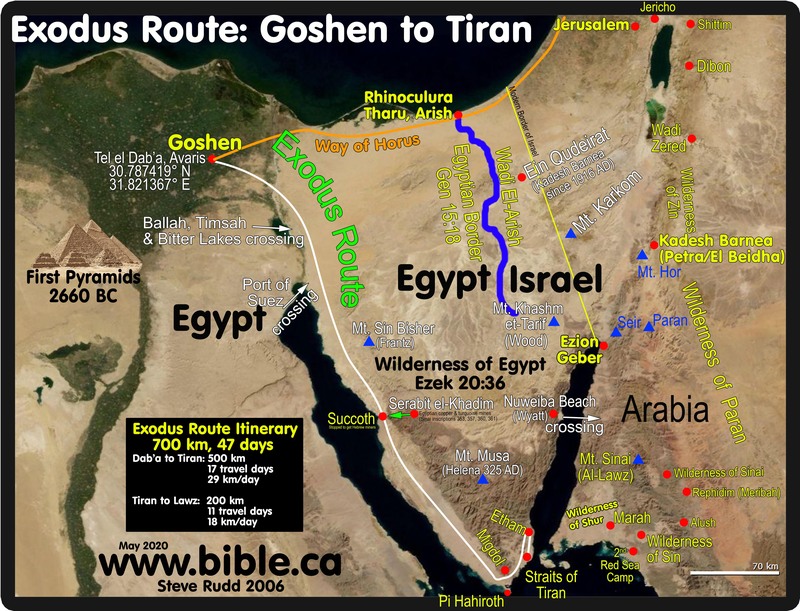 Tiran which is Baal-Zephon. We are given rather precise geographical information that Pi-hahiroth "faces" Baal-Zephon: "They journeyed from Etham and turned back to Pi-hahiroth, which faces Baal-zephon, and they camped before Migdol." Num 33:7. 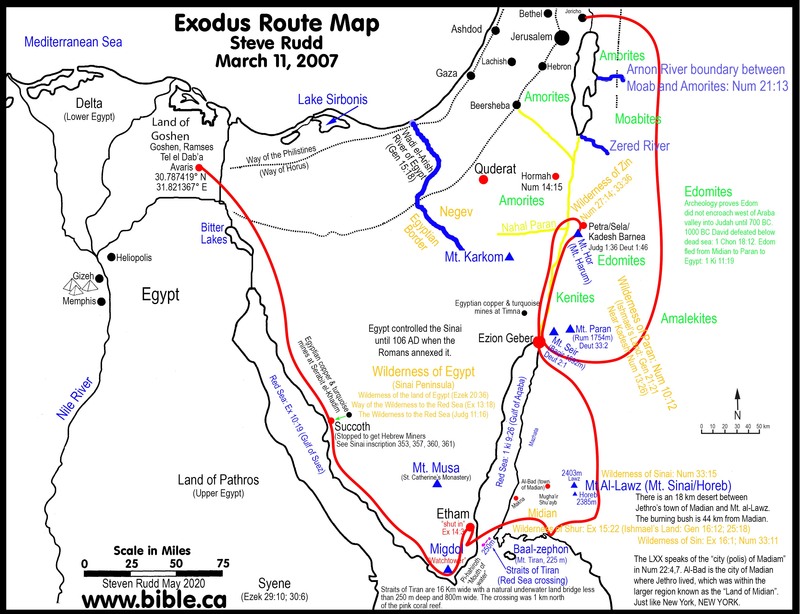 The names of the exodus routes are often given by Israel as they came there for the first time. It would not be unusual for them to name this rather prominent geographic marker for its appearance. This is how Baal-Zephon looked to the Hebrews as they were in the Red Sea camp for 8 days. Here is a view of Baal-Zephon from the hills in front of the camp. Pi-Hahiroth looked like a mouth to the Hebrews, so they named it Pi-Hahiroth. Standing on the shore where they crossed to the wilderness of Shur. Consider the popular Gulf of Suez as a choice for the crossing of the Red Sea. 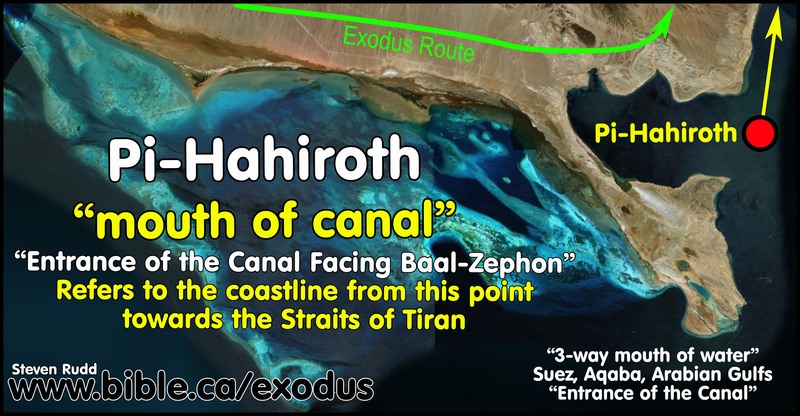 In the traditional exodus route, Baal-Zephon would be at or near the exit point where they came to land, after crossing through the "mouth of water" (Pi-hahiroth) of the north most bay of the Gulf of Suez. 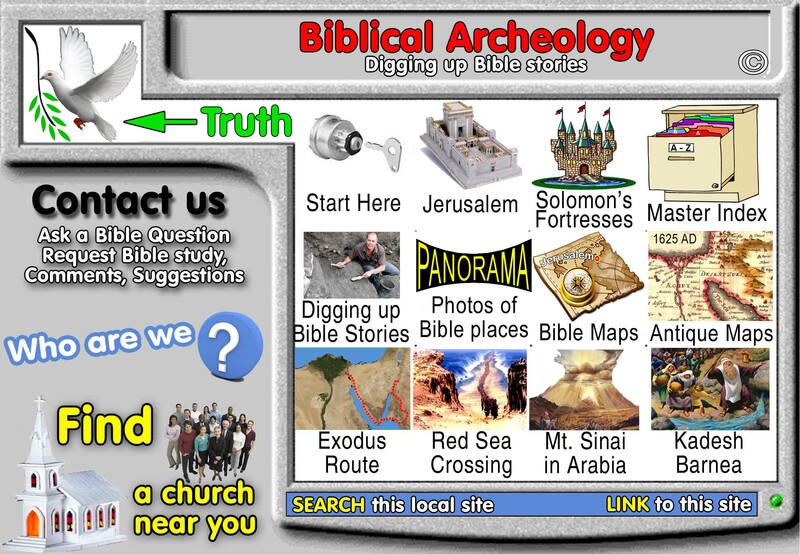 Such an important center for Baal worship should leave archeological traces. Of course there is nothing in history or archeology to confirm any such pagan cult worship center existed at the Port of Suez. Not that we would not expect to find one at such an important shipping port. Why would a major cult center for Baal, be located in Egypt? The Egyptians didn't even worship Baal. Their gods included: Re, Isis, Osirus, Horus, On, etc. But a center for Baal worship on Tiran Island makes perfect sense! It is important to remember that they went past the Pi-Hahiroth and Migdol to Etham, then back tracked to camp at the Red Sea. 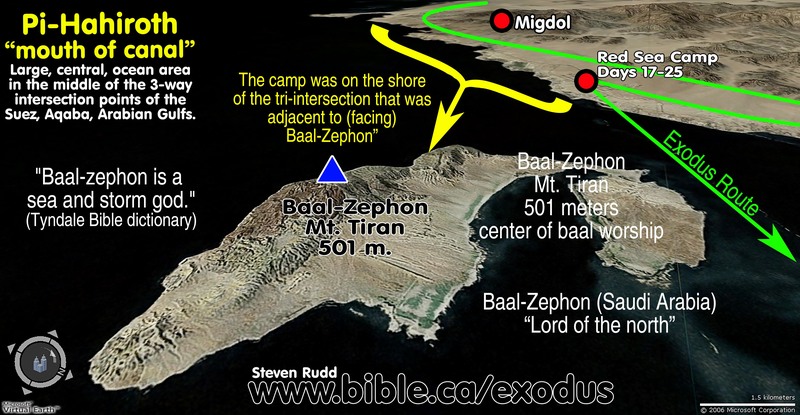 Scripture gives a detailed geographic triangulation relationship between Migdol, Pi-hahiroth and Baal-Zephon. They were to camp between the Migdol (watchtower) and Pi-hahiroth (mouth of water), directly across from Baal-Zephon (cult worship site) on the opposite shore. Problem is, the other shore is just a wide flat plain. While it is possible such a site existed, none has ever been found, even though many have looked for it. 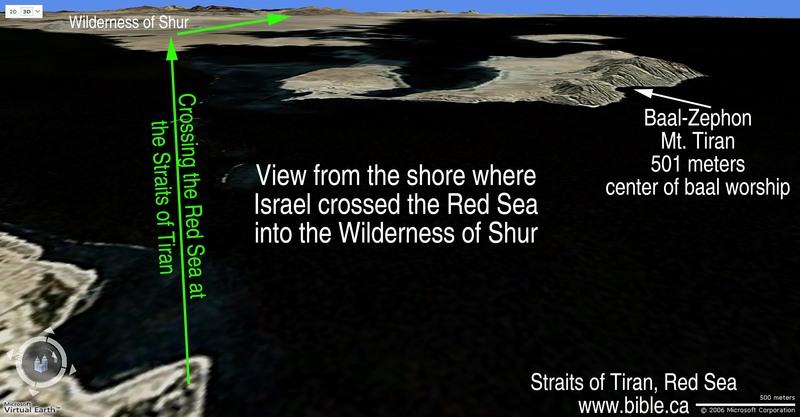 In the port of Suez crossing, they would exit the Red sea at Baal-Zephon, or very near it.